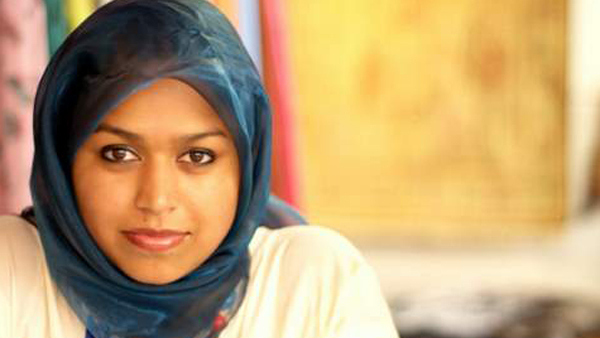 Nancy Hoque is a trailblazer looking to empower hijabis worldwide with her brand Sixteenrscarves. When I first started wearing hijab in 1994 in New York City, I have to say we did not have any options for hijabis other than a plain black triangle hijab. It was a very challenging time for a hijabi to have any sense of style, let alone think about hijab style or hijab fashion as a stand alone concept. I remember having to make the trek from Queens to Brooklyn to even find a hijab that had any color in it or wait until the Muslim Day Parade came around in the late spring. I am so glad that times have changed and we have wonderful designers who have taken the time from their lives to help enhance the wardrobes of hijabis every where! 1) What does the name sixteenrscarves stand for? I used to live on the corner of 16th and R street in Washington DC. Thats where sixteenR came from. 2) How did you get into design and modest fashion? When I started wearing a headscarf and even before that, I always tried to dress modest and have it look cool at the same time. I’ve always been into the arts, sketching almost everyday, painting, creating crafts. I would flip through fashion magazines and be inspired by the different ways women can dress. Of course the way Muslim women approach dressing is very different from how we see dressing presented in the mainstream fashion world. That aspect of this “under ground” modest fashion movement which has been underway with Muslim women the last 5 years is what inspired me to start designing and create sixteenR. 3) What is the most important piece of advice about design that you have received? Knowing what type of material you use for a scarf is really important. Whether or not it is easy to wrap or not. 4) If you could collaborate with any designer who would it be and why? This is a really hard question because I love too many designers! I would collaborate with Prada, because I love their creativity on how they present their clothes. They look into the past and take certain design elements, but their designs end up looking into the future. I also love Diane Von Furstenburg. Her story and stance on feminism is very inspiring and would totally be awesome to work with. 5) What are your top 3 essentials that every hijabi should own? 1. Under scarf. Either a headband or inner scarf. 2. A hair band to tie the hair. I would love to do a photoshoot with Yuna Zarai and style her. I would also love to dress Ibtihaj Muhammad or Nour Tagouri. 7) What part of our faith that inspires you the most? The part where it teaches you to be confident with your faith despite what others may think or say. The part that encourages to connect with your Muslim sisters and be a part of the community and to contribute. Time management and going to bed really late. 🙂 My family supports me and gives me time to work. Otherwise it would be impossible to do. I am blessed allhumdulilah. 9) What is one thing your fans may not know about you? I’ve lived in 5 different cities, in 3 different states, in 2 different countries the last 5 years. 10) What beauty product do you swear by? Great interview, and the hijabs on your site are absolutely gorgeous! I was just talking to your MOM yesterday. She was talking about SixteenR and your passion behind it! I just finished reading your interview. Your design is amazing!!! We are so proud of you. Wish u all the best.